Milpitas, California has a landfill problem. That problem is a giant green monster with butterfly wings that likes to eat trash cans and menace the locals. It takes some time for the people of Milpitas to catch on, but eventually they seek out a solution. Can the government help? The army? The town drunk? 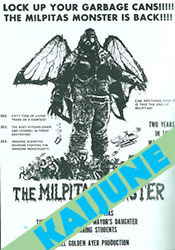 Much like Pulgasari (1985), the circumstances surrounding the creation of The Milpitas Monster are probably more interesting than anything that appears on screen. The project began as a high school art assignment: a poster for a movie that didn’t exist. The resulting creation was inspired by Milpitas’s issue with rapidly expanding landfills. This blossomed into a ten minute film, and eventually into a full-blown production, all of which was largely produced and created by high school students. What exists is often crude, but inventive. It carries with it a certain goodwill that could only exist in a community effort such as this. The opening narration by Paul Frees sets a distinctly Rocky and Bullwinkle tone for what’s to come. 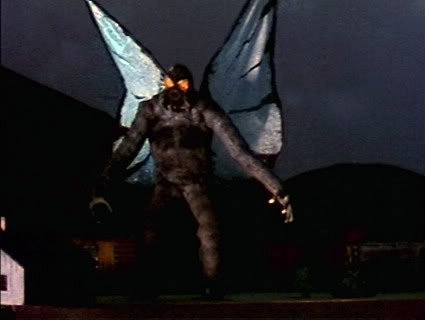 The Milpitas Monster works best when it lets the inherent ridiculousness of a giant garbage-eating, butterfly-winged slime monster just happen. Most of the actual humorous dialog falls flat, often through a combination of sub-community theater level performances and barely audible dubbed vocals. The environmental message is handled lightly, but never made light of. 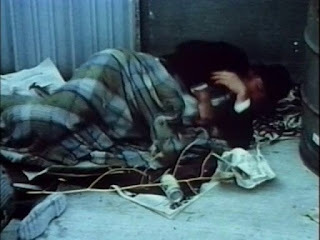 This in and of itself is remarkably novel in the downer-prone horror scene of the Seventies. The monster itself is an interesting creation, and is realized through a heady combination of man-in-suit, miniatures, and stop motion. There’s real enthusiasm and care put into its appearance on screen. The monster sparkles with just enough personality to keep the viewer invested in seeing it flitter around and eat garbage. There’s enough love on screen to gloss over all but the most technically rough moments. Which way to Point Pleasant, West Virginia? I think the real attraction for The Milpitas Monster is a peek into regional filmmaking that just doesn’t exist with homogenizing effects of digital distribution. It is now much easier to release and view films from all over the world, but as a result, they often lose the little quirks and tics that make them unique to the time and place in which they are made. Regional films serve not only a vehicle to tell a story and comment on a larger issue, but to serve as a time capsule for ephemera. The Milpitas Monster is available on Amazon Prime, and the occasional budget DVD set. These look like they are from a video tape transfer and are in terrible shape. The sound is distorted, and the image is too dark to tell what is happening in spots. The official version is here, with a reportedly much better image and sound, but I can imagine that $30 for DVD is a hurdle. The Milpitas Monster is odd little gem; its very existence is an anomaly. It is by turns, funny, corny, boring, and brilliant. If you’re a fan of weird monster movies, it’s definitely worth seeking out.